For other uses of "Deutsch", see Deutsch (disambiguation). "Duits" redirects here. It is not to be confused with Duit. German (Deutsch [ˈdɔʏtʃ]) is a West Germanic language that is mainly spoken in Central Europe. It is the most widely spoken and (co-)official language in Germany, Austria, Switzerland, South Tyrol (Italy), the German-speaking Community of Belgium, and Liechtenstein; it is also an official, but not majority language of Luxembourg. Major languages which are most similar to German include other members of the West Germanic language branch, such as Afrikaans, Dutch, and English. It is the second most widely spoken Germanic language, after English. One of the major languages of the world, German is the first language of about 95 million people worldwide and the most widely spoken native language in the European Union. German also is the third most widely taught foreign language in both the US (after Spanish and French) and the EU (after English and French; at lower secondary level), the second most commonly used scientific language as well as the third most widely used language on websites (after English and Russian). The German speaking countries are ranked fifth in terms of annual publication of new books, with one tenth of all books (including e-books) in the world being published in the German language. German derives most of its vocabulary from the Germanic branch of the Indo-European language family. A portion of German words are derived from Latin and Greek, and fewer are borrowed from French and English. With slightly different standardized variants (German, Austrian, and Swiss Standard German), German is a pluricentric language. Like English, German is also notable for its broad spectrum of dialects, with many unique varieties existing in Europe and also other parts of the world. Due to the limited intelligibility between certain varieties and Standard German, as well as the lack of an undisputed, scientific difference between a "dialect" and a "language", some German varieties or dialect groups (e.g. 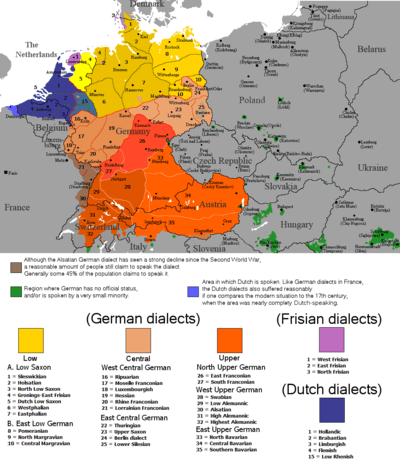 Low German or Plautdietsch) are alternatively referred to as "languages" and "dialects". The history of the German language begins with the High German consonant shift during the migration period, which separated Old High German dialects from Old Saxon. The earliest evidence of Old High German is from scattered Elder Futhark inscriptions, especially in Alemannic, from the sixth century AD; the earliest glosses (Abrogans) date to the eighth century; and the oldest coherent texts (the Hildebrandslied, the Muspilli and the Merseburg Incantations) to the ninth century. 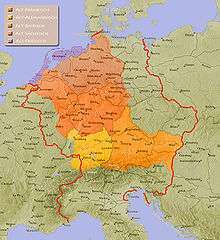 Old Saxon, at this time, belonged to the North Sea Germanic cultural sphere, and Lower Saxony was to fall under German, rather than Anglo-Frisian, influence during the existence of the Holy Roman Empire. Because Germany was divided into many different states, the only force working for a unification or standardization of German for several hundred years was the general wish of German writers to be understood by as many readers as possible. 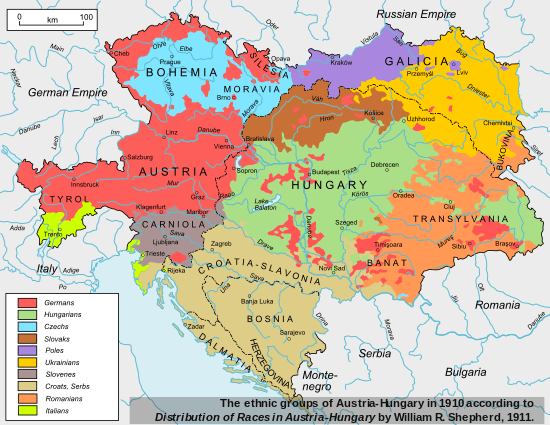 A contemporary map showing ethnicities in central Europe as of 1880. Note that Niederlande (The Netherlands) is depicted as part of the Nieder-Deutsche (Low Germans). 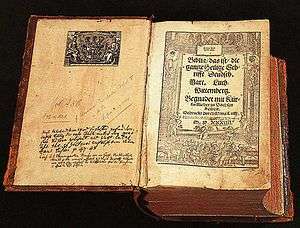 When Martin Luther translated the Bible (the New Testament in 1522 and the Old Testament, published in parts and completed in 1534), he based his translation primarily on the standard bureaucratic language used in Saxony (sächsische Kanzleisprache), also known as Meißner Deutsch (German from the city of Meissen). This language was based on Eastern Upper and Eastern Central German dialects, and preserved much of the grammatical system of Middle High German, unlike the spoken German dialects in Central and Upper Germany, which had, at that time, already begun to lose the genitive case and the preterite tense. Copies of Luther's Bible featured a long list of glosses for each region that translated words which were unknown in the region into the regional dialect. Roman Catholics initially rejected Luther's translation, and tried to create their own Catholic standard of the German language (gemeines Deutsch) – the difference in relation to "Protestant German" was minimal. It was not until the middle of the 18th century that a widely accepted standard was created, ending the period of Early New High German. Until about 1800, standard German was mainly a written language: in urban northern Germany, the local Low German (or Low Saxon) dialects were spoken. Standard German, which was markedly different, was often learned as a foreign language with uncertain pronunciation. Northern German pronunciation was considered the standard in prescriptive pronunciation guides though; however, the actual pronunciation of Standard German varies from region to region. Due to the German diaspora as well as German being the third most widely taught foreign language in the US and the EU amongst others, the geographical distribution of German speakers (or "Germanophones") spans all inhabited continents. As for the number of speakers of any language worldwide, an assessment is always compromised by the lack of sufficient, reliable data. For an exact, global number of native German speakers, this is further complicated by the existence of several varieties whose status as separate "languages" or "dialects" is disputed for political and/or linguistic reasons, including quantitatively strong varieties like certain forms of Alemannic (e.g., Alsatian) and Low German/Plautdietsch. Mostly depending on the inclusion or exclusion of certain varieties, it is estimated that approximately 90–95 million people speak German as a first language, 10-25 million as a second language, and 75–100 million as a foreign language. This would imply approximately 175-220 million German speakers worldwide. It is estimated that also including all persons who are or were taking German classes, i.e., regardless of their actual proficiency, would amount to about 280 million people worldwide with at least some knowledge of German. Mostly originating from different waves of immigration during the 19th and 20th centuries, an estimated 12,000 people speak German or a German variety as a first language in South Africa. One of the largest communities consists of the speakers of "Nataler Deutsch", a variety of Low German, concentrated in and around Wartburg. The small town of Kroondal in the North-West Province also has a mostly German speaking population. 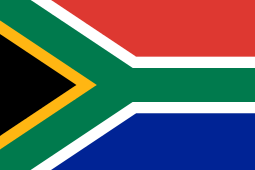 The South African constitution identifies German as a "commonly used" language and the Pan South African Language Board is obligated to promote and ensure respect for it. The community is strong enough that several German International schools are supported such as the Deutsche Schule Pretoria. Between 1843 and 1910, more than 5 million Germans emigrated overseas, mostly to the United States. German remained an important language in churches, schools, newspapers, and even the administration of the United States Brewers' Association through the early 20th century, but was severely repressed during World War I. Over the course of the 20th century, many of the descendants of 18th century and 19th century immigrants ceased speaking German at home, but small populations of speakers are still found in Pennsylvania (Amish, Hutterites, Dunkards and some Mennonites historically spoke Hutterite German and a West Central German variety of German known as Pennsylvania German or Pennsylvania Dutch), Kansas (Mennonites and Volga Germans), North Dakota (Hutterite Germans, Mennonites, Russian Germans, Volga Germans, and Baltic Germans), South Dakota, Montana, Texas (Texas German), Wisconsin, Indiana, Oregon, Oklahoma, and Ohio (72,570). A significant group of German Pietists in Iowa formed the Amana Colonies and continue to practice speaking their heritage language. Early twentieth century immigration was often to St. Louis, Chicago, New York, Milwaukee, Pittsburgh and Cincinnati. 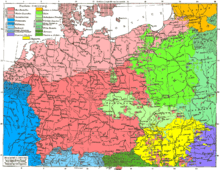 The dialects of German which are or were primarily spoken in colonies or communities founded by German-speaking people resemble the dialects of the regions the founders came from. For example, Hutterite German resembles dialects of Carinthia. Texas German is a dialect spoken in the areas of Texas settled by the Adelsverein, such as New Braunfels and Fredericksburg. In the Amana Colonies in the state of Iowa, Amana German is spoken. Plautdietsch is a large minority language spoken in Northern Mexico by the Mennonite communities, and is spoken by more than 200,000 people in Mexico. Pennsylvania German is a West Central German dialect spoken by most of the Amish population of Pennsylvania, Ohio, and Indiana and resembles Palatinate German dialects. Hutterite German is an Upper German dialect of the Austro-Bavarian variety of the German language, which is spoken by Hutterite communities in Canada and the United States. Hutterite is spoken in the U.S. states of Washington, Montana, North Dakota, South Dakota, and Minnesota; and in the Canadian provinces of Alberta, Saskatchewan and Manitoba. Its speakers belong to some Schmiedleit, Lehrerleit, and Dariusleit Hutterite groups, but there are also speakers among the older generations of Prairieleit (the descendants of those Hutterites who chose not to settle in colonies). Hutterite children who grow up in the colonies learn to speak Hutterite German before learning English, the standard language of the surrounding areas, in school. Many of these children, though, continue with German Grammar School, in addition to public school, throughout a student's elementary education. In Canada, there are 622,650 speakers of German according to the most recent census in 2006, with people of German ancestry (German Canadians) found throughout the country. German-speaking communities are particularly found in British Columbia (118,035) and Ontario (230,330). There is a large and vibrant community in the city of Kitchener, Ontario, which was at one point named Berlin. German immigrants were instrumental in the country's three largest urban areas: Montreal, Toronto, and Vancouver; post-Second World War immigrants managed to preserve a fluency in the German language in their respective neighborhoods and sections. In the first half of the 20th century, over a million German-Canadians made the language Canada's third most spoken after French and English. In Mexico there are also large populations of German ancestry, mainly in the cities of: Mexico City, Puebla, Mazatlán, Tapachula, Ecatepec de Morelos, and larger populations scattered in the states of Chihuahua, Durango, and Zacatecas. Municipalities where Pomeranian dialects are co-official in Espírito Santo, Brazil. 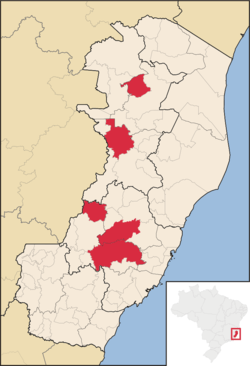 In Brazil, the largest concentrations of German speakers are in the states of Rio Grande do Sul (where Riograndenser Hunsrückisch developed), Santa Catarina, Paraná, São Paulo and Espírito Santo. There are also important concentrations of German-speaking descendants in Argentina, Chile, Paraguay, Venezuela, Peru and Bolivia. In the 20th century, over 100,000 German political refugees and invited entrepreneurs settled in Latin America, in countries such as Costa Rica, Panama, Venezuela, and the Dominican Republic, to establish German-speaking enclaves, and reportedly there is a small German immigration to Puerto Rico. In most locations where German immigrants settled, the vast majority of their descendants no longer speak German, as they have been largely assimilated into the host language and culture of the specific location of settlement; generally Spanish or Portuguese. German migration to New Zealand in the 19th century was less pronounced than migration from Britain, Ireland, and perhaps even Scandinavia. Despite this there were significant pockets of German-speaking communities which lasted until the first decades of the 20th century. German-speakers settled principally in Puhoi, Nelson, and Gore. At the last census (2006), 37,500 people in New Zealand spoke German, making it the third most spoken European language after English and French and overall the ninth most spoken language. Like French and Spanish, German has become a classic second foreign language in the western world, as English (Spanish in the US) is well established as first foreign language. German ranks second (after English) among the best known foreign languages in the EU (on a par with French) as well as in Russia. In terms of student numbers across all levels of education, German ranks third in the EU (after English and French) as well as in the United States (after Spanish and French). In 2015, approximately 15.4 million people were in the process of learning German across all levels of education worldwide. As this number remained relatively stable since 2005 (± 1 million), roughly 75–100 million people able to communicate in German as foreign language can be inferred assuming an average course duration of three years and other estimated parameters. According to a 2012 survey, 47 million people, i.e., up to two thirds of this global number, within the EU claimed to have sufficient German skills to have a conversation. Within the EU, not counting countries where it is an official language, German as a foreign language is most popular in Eastern and Northern Europe, namely the Czech Republic, Croatia, Denmark, the Netherlands, Slovakia, Slovenia, Sweden and Poland. German was once and, to some extent, is still, a lingua franca in those parts of Europe. Distribution of the native speakers of major continental West-Germanic dialectal varieties. German is a member of the West Germanic language of the Germanic family of languages, which in turn is part of the Indo-European language family. The German dialects are the traditional local varieties, many of them are hardly understandable to someone who knows only standard German, and they have great differences in lexicon, phonology and syntax. If a narrow definition of language based on mutual intelligibility is used, many German dialects are considered to be separate languages (for instance in the Ethnologue). However, such a point of view is unusual in German linguistics. The 18th and 19th centuries were marked by mass education in Standard German in schools. Gradually, Low German came to be politically viewed as a mere dialect spoken by the uneducated. Today, Low Saxon can be divided in two groups: Low Saxon varieties with a reasonable Standard German influx and varieties of Standard German with a Low Saxon influence known as Missingsch. Sometimes, Low Saxon and Low Franconian varieties are grouped together because both are unaffected by the High German consonant shift. However, the proportion of the population who can understand and speak it has decreased continuously since World War II. High German is divided into Central German, High Franconian (a transitional dialect), and Upper German. Central German dialects include Ripuarian, Moselle Franconian, Rhine Franconian, Central Hessian, East Hessian, North Hessian, Thuringian, Silesian German, Lorraine Franconian, Mittelalemannisch, North Upper Saxon, High Prussian, Lausitzisch-Neumärkisch and Upper Saxon. It is spoken in the southeastern Netherlands, eastern Belgium, Luxembourg, parts of France and parts of Germany roughly between the river Main and the southern edge of the Lowlands. Modern Standard German is mostly based on Central German, but the common (linguistically incorrect) German term for modern Standard German is Hochdeutsch, High German. The Moselle Franconian varieties spoken in Luxembourg have been officially standardised and institutionalised and are usually considered a separate language known as Luxembourgish. The two High Franconian dialects are East Franconian and South Franconian. Upper German dialects include Northern Austro-Bavarian, Central Austro-Bavarian, Southern Austro-Bavarian, Swabian, East Franconian, High Alemannic German, Highest Alemannic German, Alsatian and Low Alemannic German. They are spoken in parts of the Alsace, southern Germany, Liechtenstein, Austria, and the German-speaking parts of Switzerland and Italy. 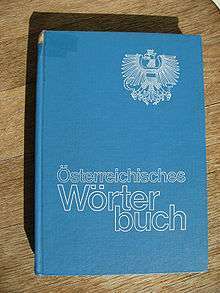 Wymysorys is a High German dialect of Poland native to Wilamowice, and Sathmarisch and Siebenbürgisch are High German dialects of Romania. The High German varieties spoken by Ashkenazi Jews (mostly in the former Russian Empire) have several unique features, and are usually considered as a separate language, Yiddish. It is the only Germanic language that does not use the Latin script as the basis of its standard alphabet. This degree of inflection is considerably less than in Old High German and other old Indo-European languages such as Latin, Ancient Greek, and Sanskrit, and it is also somewhat less than, for instance, Old English, modern Icelandic and Russian. The three genders have collapsed in the plural. With four cases and three genders plus plural, there are 16 permutations of case and gender/number, but there are only six forms of the definite article, which together cover all 16 permutations. In nouns, inflection for case is required in the singular for strong masculine and neuter nouns, in the genitive and sometimes in the dative. Both of these cases are losing ground to substitutes in informal speech. The dative noun ending is considered somewhat old-fashioned in many contexts and is often dropped, but it is still used in proverbs and the like, in formal speech and in written language. Weak masculine nouns share a common case ending for genitive, dative and accusative in the singular. Feminine nouns are not declined in the singular. The plural has an inflection for the dative. 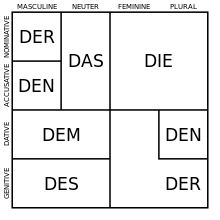 In total, seven inflectional endings (not counting plural markers) exist in German: -s, -es, -n, -ns, -en, -ens, -e.
the distinction between grammatical aspects is rendered by combined use of subjunctive and/or preterite marking so the plain indicative voice uses neither of those two markers; the subjunctive by itself conveys secondhand information; subjunctive plus preterite marks the conditional state; and the preterite alone shows either plain indicative (in the past), or functions as a (literal) alternative for either second-hand-information or the conditional state of the verb, when necessary for clarity. ÖWB, Austrian Dictionary from 1985. Most German vocabulary is derived from the Germanic branch of the European language family. However, there are a significant amount of loanwords from other languages, in particular from Latin, Greek, Italian, French and most recently English. 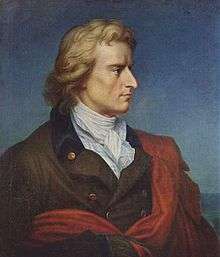 In the early 19th century, Joachim Heinrich Campe estimated that one fifth of the total German vocabulary was of French or Latin origin. The Duden is the de facto official dictionary of the German language, first published by Konrad Duden in 1880. The Duden is updated regularly, with new editions appearing every four or five years. As of August 2013 it is in its 26th edition and in 12 volumes, each covering different aspects such as loanwords, etymology, pronunciation, synonyms, and so forth. The first of these volumes, Die deutsche Rechtschreibung (English: German Orthography), has long been the prescriptive source for the spelling of German. The Duden has become the bible of the German language, being the definitive set of rules regarding grammar, spelling and usage of German. German is written in the Latin alphabet. In addition to the 26 standard letters, German has three vowels with Umlaut, namely ä, ö and ü, as well as the Eszett or scharfes s (sharp s), ß. 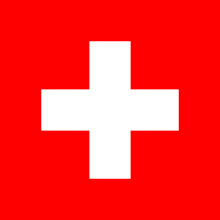 In Switzerland "ss" is used instead of "ß". Additionally, when written in capitals, "ß" is replaced with "ss" in Germany, whereas in Austria it is traditionally replaced with "sz" (the same digraph used in Hungarian for the "s" sound); there are some exceptions to these rules (see below). Before the German orthography reform of 1996, ß replaced ss after long vowels and diphthongs and before consonants, word-, or partial-word-endings. In reformed spelling, ß replaces ss only after long vowels and diphthongs. Because there is no capital ß, it is always written as "SS" when capitalization is required. For example, Maßband (tape measure) is capitalized MASSBAND. An exception is the use of ß in legal documents and forms when capitalizing names. To avoid confusion with similar names, an "ß" is used instead of "SS". (So: "KREßLEIN" instead of "KRESSLEIN".) A capital ß has been proposed and included in Unicode ("ẞ"; Unicode character U+1E9E), but it is not yet recognized as standard German. In Switzerland, ß is not used at all. 4 The voiced stops /b/, /d/, /a/ are devoiced to /p/, /t/, /k/, respectively, in word-final position. 5/d͡ʒ/ and /ʒ/ occur only in words of foreign (usually English or French) origin. ch occurs often and is pronounced either [ç] (after ä, ai, äu, e, ei, eu, i, ö, ü and consonants; in the diminutive suffix -chen; and at the beginning of a word), [x] (after a, au, o, u), or [k] at the beginning of a word before a, o, u and consonants. Ch never occurs at the beginning of an originally German word. 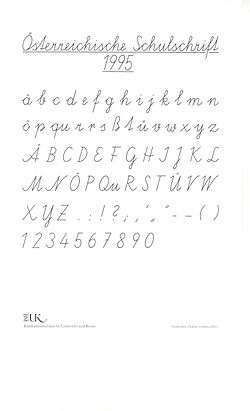 In borrowed words with initial Ch before front vowels (Chemie "chemistry" etc. ), [ç] is considered standard. However, Upper Germans and Franconians (in the geographical sense) replace it with [k], as German as a whole does before darker vowels and consonants such as in Charakter, Christentum. Middle Germans (except Franconians) will borrow a [ʃ] from the French model. Both agree in considering each other's variant, and Upper Germans also the standard in [ç], as particularly awkward and unusual. j is pronounced [j] in Germanic words (Jahr [jaːɐ]) (like "y" in "year"). In recent loanwords, it follows more or less the respective languages' pronunciations. r is usually pronounced in a guttural fashion (a voiced uvular fricative [ʁ] or uvular trill [ʀ]) in front of a vowel or consonant (Rasen [ˈʁaːzən]; Burg [buʁk]). In spoken German, however, it is commonly vocalised after a vowel (er being pronounced rather like [ˈɛɐ] – Burg [buɐk]). In some varieties, the r is pronounced as a "tongue-tip" r (the alveolar trill [r]). s in German is pronounced [z] (as in "zebra") if it forms the syllable onset (e.g. Sohn [zoːn]), otherwise [s] (e.g. Bus [bʊs]). In Austria and Switzerland and often in Southern Germany, it is always pronounced [s]. A ss [s] indicates that the preceding vowel is short. st and sp at the beginning of words of German origin are pronounced [ʃt] and [ʃp], respectively. ß (a letter unique to German called scharfes S or Eszett) was a ligature of a double s and of an sz and is always pronounced [s]. Originating in Blackletter typeface, it traditionally replaced ss at the end of a syllable (e.g. ich muss → ich muß; ich müsste → ich müßte); within a word it contrasts with ss [s] in indicating that the preceding vowel is long (compare in Maßen [in ˈmaːsən] "with moderation" and in Massen [in ˈmasən] "in loads"). The use of ß has recently been limited by the latest German spelling reform and is no longer used for ss after a short vowel (e.g. ich muß and ich müßte were always pronounced with a short U/Ü); Switzerland and Liechtenstein already abolished it in 1934.
tion in Latin loanwords is pronounced [tsion]. y is pronounced as [y] when long, and [ʏ] when short (as in Hygiene [hygiːnə] ; Labyrinth [labyˈʁɪnt] or Gymnasium /ɡʏmˈnaːziʊm/), except in ay and ey which are both pronounced [ai]. It is also often used in loanwords and pronounced like in the original language like in Style or Recycling. For more details on this topic, see High German consonant shift. Likewise, the gh in Germanic English words, pronounced in several different ways in modern English (as an f, or not at all), can often be linked to German ch: "to laugh" → lachen, "through" and "thorough" → durch, "high" → hoch, "naught" → nichts, "light" → leicht or Licht, "sight" → Sicht, "daughter" → Tochter, "neighbour" → Nachbar. Reformer and theologian Martin Luther, who was the first to translate the Bible into German, is widely credited for having set the basis for the modern "High German" language. 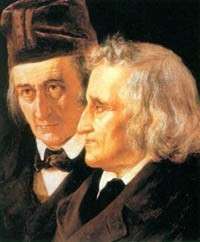 Among the most well known German poets and authors are Lessing, Goethe, Schiller, Kleist, Hoffmann, Brecht and Heine. 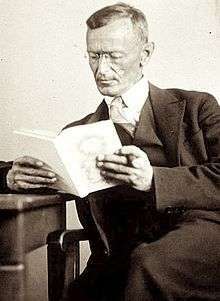 Thirteen German-speaking people have won the Nobel Prize in literature: Theodor Mommsen, Rudolf Christoph Eucken, Paul von Heyse, Gerhart Hauptmann, Carl Spitteler, Thomas Mann, Nelly Sachs, Hermann Hesse, Heinrich Böll, Elias Canetti, Günter Grass, Elfriede Jelinek and Herta Müller. 1 2 3 4 5 6 7 8 9 10 11 12 13 14 15 16 17 Ammon, Ulrich (November 2014). "Die Stellung der deutschen Sprache in der Welt" (in German) (1st ed.). Berlin, Germany: de Gruyter. ISBN 978-3-11-019298-8. Retrieved 24 July 2015. 1 2 3 4 5 "Special Eurobarometer 386: Europeans and their languages" (PDF) (report). European Commission. June 2012. Retrieved 24 July 2015. ↑ "Rat für deutsche Rechtschreibung – Über den Rat". Rechtschreibrat.ids-mannheim.de. Retrieved 11 October 2010. 1 2 3 4 Jan Goossens: Niederdeutsche Sprache: Versuch einer Definition. In: Jan Goossens (Hrsg. ): Niederdeutsch: Sprache und Literatur. Karl Wachholtz, 2. Auflage, Neumünster 1983, S. 27; Willy Sanders: Sachsensprache, Hansesprache, Plattdeutsch: sprachgeschichtliche Grundzüge des Niederdeutschen. Vandenhoeck & Ruprecht, Göttingen 1982, ISBN 3-525-01213-6, S. 32 f.; Dieter Stellmacher: Niederdeutsche Sprache. 2. Auflage, Weidler, Berlin 2000, ISBN 3-89693-326-4, S. 92. ↑ "German 'should be a working language of EU', says Merkel's party". The Daily Telegraph. 18 June 2013. 1 2 3 Modern Language Association, February 2015, Enrollments in Languages Other Than English in United States Institutions of Higher Education, Fall 2013. Retrieved 7 July 2015. ↑ "More than 80% of primary school pupils in the EU were studying a foreign language in 2013" (PDF). Eurostat. 24 September 2015. Retrieved 3 May 2016. ↑ "Why Learn German?". Goethe Institute. Retrieved 28 September 2014. ↑ "Why Learn German?". SDSU – German Studies Department of European Studies. Retrieved 28 September 2014. ↑ European Commission (2004). "Many tongues, one family. Languages in the European Union" (PDF). Europa (web portal). Retrieved 5 April 2013. ↑ Calvin, Thomas. An Anthology of German Literature. D. C. Heath & co. pp. 5–6. OCLC 6128632. ↑ Fahlbusch, Erwin and Bromiley, Geoffrey William. The Encyclopedia of Christianity. Grand Rapids, MI: Leiden, Netherlands: Wm. B. Eerdmans; Brill, 1999–2003, 1:244. ↑ Anstalt G. Freytag & Berndt (1911). Geographischer Atlas zur Vaterlandskunde an der österreichischen Mittelschulen. Vienna: K. u. k. Hof-Kartographische. "Census December 31st 1910"
↑ A magyar szent korona országainak 1910. évi népszámlálása. Első rész. A népesség főbb adatai. (in Hungarian). Budapest: Magyar Kir. Központi Statisztikai Hivatal (KSH). 1912. ↑ Synopsis of the Deutsches Wörterbuch (English) at the Language Research Centre, Berlin-Brandenburg Academy of Sciences and Humanities, retrieved 27 June 2012. ↑ Dieter Nerius: Die Rolle der II. Orthographischen Konferenz (1901) in der Geschichte der deutschen Rechtschreibung. In: Zeitschrift für deutsche Philologie (ISSN 0044-2496), 119. Jahrgang 2000, Nr. 1, S. 30-54. ↑ Upward, Chris (1997). "Spelling Reform in German". Journal of the Simplified Spelling Society. J21: 22–24, 36. Archived from the original on 23 September 2014. 1 2 3 "Foreign language learning statistics - Statistics Explained". Ec.europa.eu. 17 March 2016. Retrieved 18 July 2016. ↑ Marten, Thomas; Sauer, Fritz Joachim, eds. (2005). Länderkunde – Deutschland, Österreich, Schweiz und Liechtenstein im Querschnitt [Regional Geography – An Overview of Germany, Austria, Switzerland and Liechtenstein] (in German). Berlin: Inform-Verlag. p. 7. ISBN 3-9805843-1-3. 1 2 3 4 5 6 7 8 9 Bureau des Traités. "Recherches sur les traités". Conventions.coe.int. Retrieved 18 July 2016. ↑ "Autochthonous Linguistic Minorities in the Italian Alps:". Rga.revues.org. 20 December 1999. Retrieved 18 July 2016. 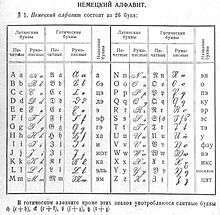 ↑ "Kazakhstan - Languages". Ethnologue.com. Retrieved 18 July 2016. ↑ "Kazakhstan - Law on Languages". Usefoundation.org. 11 July 1997. Retrieved 18 July 2016. ↑ "Map on page of Polish Commission on Standardization of Geographical Names" (PDF). Retrieved 20 June 2015. ↑ "Устав азовского районного совета от 21.05.2002 N 5-09 устав муниципального". Russia.bestpravo.com. Retrieved 18 July 2016. ↑ "Charte européenne des langues régionales : Hollande nourrit la guerre contre le français". Lefigaro.fr. Retrieved 18 July 2016. 1 2 3 "Deutsch in Namibia" (PDF) (in German). 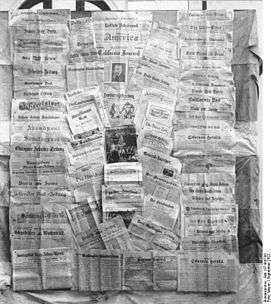 Supplement of the Allgemeine Zeitung. 18 August 2007. Retrieved 23 June 2008. ↑ Deumert, Ama (2003). Markedness and salience in language contact and second-language acquisition: evidence from a non-canonical contact language. Language Sciences. 25. Elsevier Ltd. doi:10.1016/S0388-0001(03)00033-0. ↑ "Constitution of the Republic of South Africa, 1996 - Chapter 1: Founding Provisions | South African Government". Gov.za. Retrieved 18 July 2016. ↑ "Table 5. Detailed List of Languages Spoken at Home for the Population 5 Years and Over by State: 2000" (PDF). Retrieved 15 March 2010. ↑ "Germans from Russia Heritage Collection". Library.ndsu.edu. Retrieved 18 July 2016. ↑ 49.2 million German Americans as of 2005 according to the United States Census Bureau. "US demographic census". Archived from the original on 24 November 2011. Retrieved 2 August 2007. ; the 1990 census gives 57.9 million, or 23.3% of the U.S. population. ↑ Documentary History of the United States Brewers' Association. ↑ "Archived copy". Archived from the original on 15 August 2013. Retrieved 10 August 2013. 1 2 "Statistics Canada 2006". 2.statcan.ca. 6 January 2010. Retrieved 15 March 2010. 1 2 3 4 "IPOL realizará formação de recenseadores para o censo linguístico do município de Antônio Carlos-SC | IPOL". E-ipol.org. Retrieved 18 July 2016. ↑ "Legislative Assembly of the state of Espírito Santo (Commissioner for Culture and Social Communication – Addition to the constitutional amendment number 11/2009 establishing the Pomeranian dialect as well as German as cultural heritage of the state" (PDF). Claudiovereza.files.wordpress.com. February 2011. Retrieved 18 July 2016. ↑ Holm, John A. (1989). "Pidgins and Creoles: Volume 2, Reference Survey" (1st ed.). Cambridge, UK: Cambridge University Press. p. 616. ISBN 0521359406. Retrieved 12 June 2016. 1 2 "Deutsch als Fremdsprache weltweit. Datenerhebung 2015 – Worldwide survey of people learning German; conducted by the German Ministry for Foreign Affairs and the Goethe Institute" (PDF). Goethe.de. Retrieved 18 July 2016. ↑ Знание иностранных языков в России [Knowledge of foreign languages in Russia] (in Russian). Levada Centre. 16 September 2008. Retrieved 10 May 2015. ↑ "Foreign Language Enrollments in K–12 Public Schools" (PDF). American Council on the Teaching of Foreign Languages (ACTFL). February 2011. Retrieved 17 October 2015. ↑ von Polenz, Peter (1999). "6.5. Inter- und übernationale Beziehungen". Deutsche Sprachgeschichte vom Spätmittelalter bis zur Gegenwart. 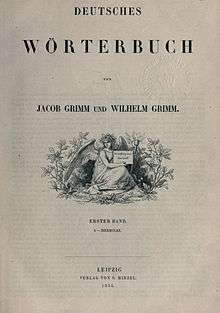 de Gruyter Studienbuch (in German). Band III: 19. und 20. Jahrhundert. Berlin; New York: de Gruyter. pp. 192–194, 196. ISBN 3-11-016426-4. Retrieved 21 August 2014. ↑ Ulrich Ammon, Hans Bickel, Jakob Ebner, et al. : Variantenwörterbuch des Deutschen. Die Standardsprache in Österreich, der Schweiz und Deutschland sowie in Liechtenstein, Luxemburg, Ostbelgien und Südtirol. Walter de Gruyter, Berlin 2004. ↑ Verein Deutsche Sprache e.V. "Verein Deutsche Sprache e.V. – Der Anglizismen-Index". Vds-ev.de. Retrieved 15 March 2010. ↑ "Ein Hinweis in eigener Sache". Wortschatz.informatik.uni-leipzig.de. 7 January 2003. Retrieved 15 March 2010. ↑ Gerhard Weiss (1995). "Up-to-Date and with a Past: The "Duden" and Its History". Die Unterrichtspraxis / Teaching German. Wiley. 6 (1: The Publisher as Teacher): 7–21. doi:10.2307/3531328. JSTOR 3531328. 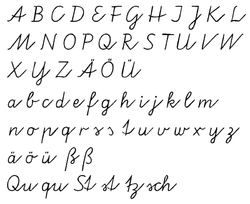 ↑ Kapr, Albert (1993). Fraktur: Form und Geschichte der gebrochenen Schriften. Mainz: H. Schmidt. p. 81. ISBN 3-87439-260-0. ↑ "Mittelschulvorbereitung Deutsch". Mittelschulvorbereitung.ch. Retrieved 15 March 2010. ↑ For a history of the German consonants see Fausto Cercignani, The Consonants of German: Synchrony and Diachrony, Milano, Cisalpino, 1979. ↑ "Learning German, Experiencing Culture – Goethe-Institut". Goethe.de. Retrieved 24 January 2012. ↑ "Verein Deutsche Sprache e.V.". Vds-ev.de. Retrieved 18 July 2016. ↑ "Who we are". DW.DE. 31 December 2011. Retrieved 14 June 2013.
uppe1397 (Upper German)<ref name='Glottolog2'> Hammarström, Harald; Forkel, Robert; Haspelmath, Martin; Bank, Sebastian, eds. (2016). "Upper German". Glottolog 2.7. Jena: Max Planck Institute for the Science of Human History. yec – YenishGlottolog high1287 (High Franconian)<ref name='Glottolog'> Hammarström, Harald; Forkel, Robert; Haspelmath, Martin; Bank, Sebastian, eds. (2016). "High Franconian". Glottolog 2.7. Jena: Max Planck Institute for the Science of Human History. ↑ The status of Plautdietsch as a German variety or separate language is subject to discussion. "German Language". Encyclopædia Britannica (11th ed.). 1911. "Germany, Language and Literature of". The American Cyclopædia. 1879.